Above - Leicester Square from Leicester Place, showing the Exterior of the former Sans Souci Theatre to the near left - From 'The Repository of arts, literature, commerce, manufactures, fashions and politics' by Rudolph Ackermann, published in January 1812. 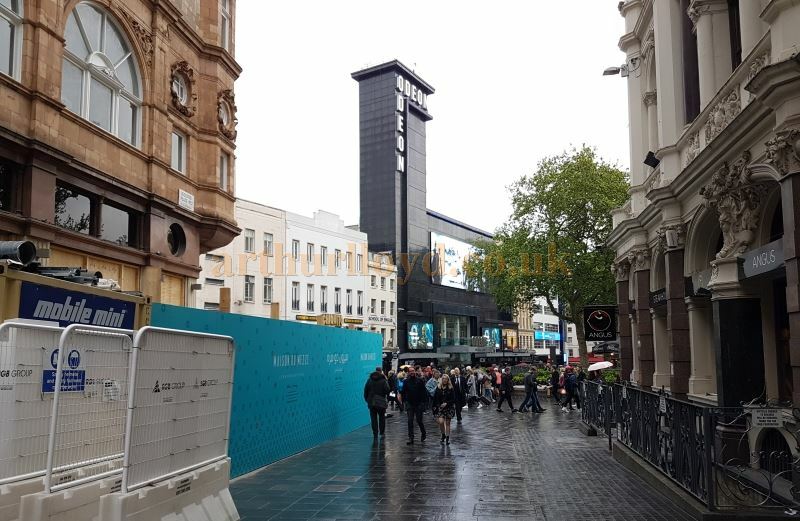 The image also shows the buildings which were formerly on the site of the later Royal Panopticon of Science and Art, subsequently the Alhambra Theatre, and today, the Odeon, Leicester Square. There were two Sans Souci Theatres, both built for the dramatist, composer, and painter Charles Dibdin, the first of which was situated in the Strand, opposite Beaufort Buildings, opening on February the 16th 1793. This first Theatre, which was 'planned, painted, and decorated by Dibdin himself', was closed in 1796 when his licence from the Lord Chamberlain ran out. He then acquired a plot of land in Leicester Place, just off Leicester Square, in which he erected a new Theatre to replace the old one. The new plot had houses on either side so he only had to build a front and back wall, and roof it in, and because the dimensions of the new building were almost exactly the same as the old one, it was a simple matter to transfer the interior of the old Theatre to the new one. 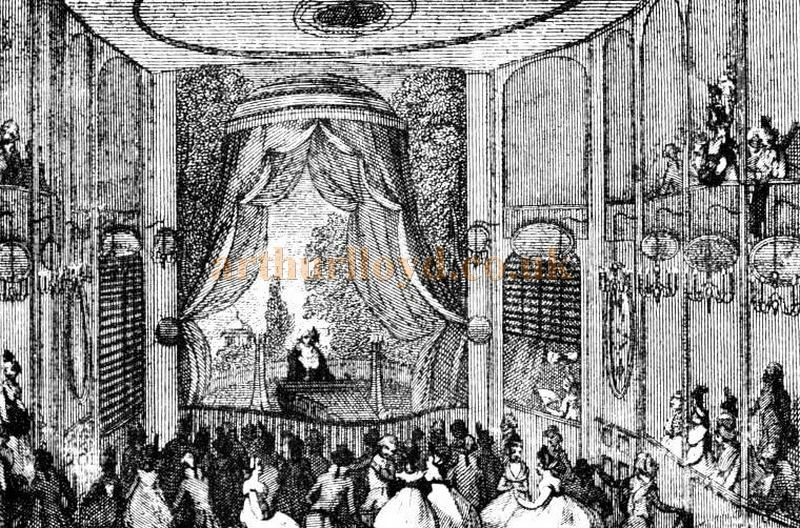 This second Sans Souci Theatre, illustrations of which are shown above and below, was constructed in just 12 weeks, and at a cost of £6,000. The Theatre opened on the 8th of October 1796 and could seat 500 people. Between 1796 and 1804 Dibdin performed at the Leicester Place Theatre three times a week in various productions including plays and his own song recitals, indeed it is said that he wrote and performed around a thousand songs for the Theatre. Above - The Auditorium and Stage of the Sans Souci Theatre, Leicester Place - From 'Two centuries of Soho' by John Henry Cardwell, published in 1898. In 1805 Frederck Schirmer took over the Theatre, which he named the German Theatre, and produced musical and dramatic German language productions there. And in 1806 the Theatre was taken over by Henry Francis Greville who renamed it the Academical Theatre, producing plays and other entertainments, all performed by children. 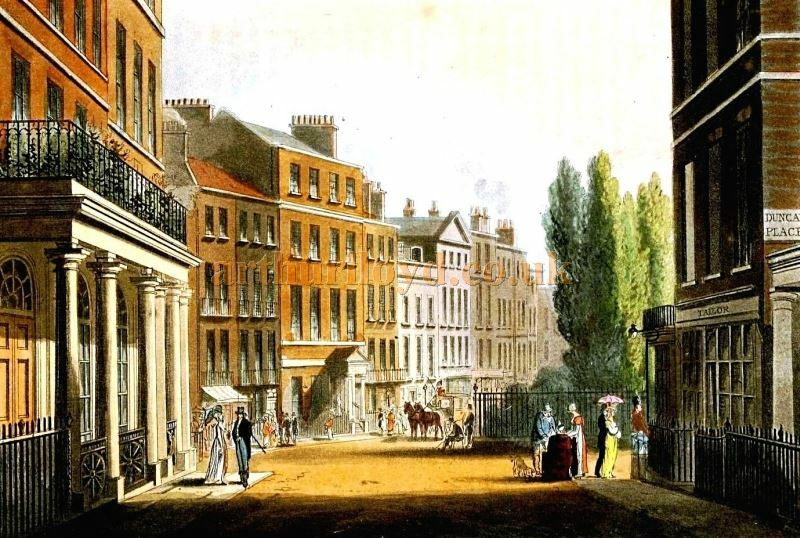 Despite the changes of management and names, Charles Dibdin still held the lease on the building, but in July 1807 he transferred the lease of the Theatre to Thomas Cane, a hosier in the Strand. The lease was for 63 years at a rent of £298 per year, the building was in use as a warehouse by the following year. Dibdin would die not long after, in 1814. The building was in warehouse use from 1808 to 1828 under the occupation of the clothing Company B. Carder and Co. But by the early 1830s it was occupied by a theatre agent named Mr. Smythson. He put on the occasional performances and benefits there, sometimes under the Theatre's original name of the Sans Souci, and sometimes as the Vaudeville Subscription Theatre. In 1832 Bejamin Palmer began using it for theatrical performances too, again under its original name of the Sans Souci. However, Palmer became insolvent in 1835 and the building was then bought by a draper called Isaac Newton who owned the building next door. By 1841 the building was in use as a restaurant and by 1844 it had become an hotel called the Hotel de Versailles. Its theatrical days long over the building was finally demolished in the late 1890s and part of a new building for the NSPCC called Victory House was then constructed on the site, see photo below. Above - Leicester Square from Leicester Place in April 2017, showing the site of the former Sans Souci Theatre to the near left. The photograph also shows the Odeon, Leicester Square which was built on the site of the former Royal Panopticon of Science and Art, and the Alhambra Theatre. The 1898 book 'Two centuries of Soho' by John Henry Cradle has a small piece on Charles Dibdin and the Sans Souci saying:- 'Even in these days of "Nancy Lee," and "They all love Jack," most of us have a kindly thought for glorious "Tom Bowling," and we are sorry to think of the stress and storm, and final shipwreck, of the career of honest and gifted Charles Dibdin, the composer of "Tom Bowling,'' and about six hundred other stirring sea songs. Four years before the beginning of the nineteenth century, Dibdin, who had previously been doing his best with a little hall in the Strand, built and opened in Leicester Square his small Sans Souci Theatre in twelve weeks. The site was not far from that of the present Daly's. Except that there were no changes of costume, Dibdin's entertainment appears to have been rather on the lines of the show provided by the German Reeds and the admirable John Parry, whom the writer can remember at the Gallery of Illustration nearly five-and-thirty years ago. For the amusement of his patrons the Manager depended mostly upon his own melodies and slight dramatic sketches, though there is a remarkable, and apparently true, story of the great tragedian, Edmund Kean, having appeared in his boyhood at the Sans Souci as an acrobat. Poor Dibdin did not find music without vulgarity, wit without wickedness, very saleable commodities in the Leicester Square of those days, whatever they may be in our own. In spite of the slender proceeds of a music shop attached to the theatre, where the composer sold the songs on his own account which had previously enriched only the retail dealers in such delicate brain ware, Dibdin found it impossible, after a few years' trial, to meet his expenses, while ensuring for himself the most moderate amount of profit. On the strength of 200 a year granted him by the Government, he closed his elegant little theatre, and retired from public life. But the succeeding Administration brutally took his small pension away, and, at the age of sixty-three, he again opened a music shop as a means of bare livelihood, and subsequently went into bankruptcy, poverty, paralysis, and death. It was only a portion of his Government pittance that was restored to him, when it was too late; and the great amusement-loving Public that shouts itself hoarse over its favourites in the heyday of their triumphs, has little thought for them when they are faded, or past service. The late Lady Rosebery unveiled a memorial to Charles Dibdin in Camden Road; a fifty pound note, in his burdened lifetime, would have done more good to the man, some of whose sea songs will last as long as the English language remains a vehicle of musical expression, and Britannia rules the waves.' - 'Two centuries of Soho' by John Henry Cardwell 1898. The 1904 book 'History of The London Stage' by H. Barton Baker briefly mentions the Sans Souci Theatre saying:- 'At the end of the eighteenth century, Charles Dibdin fitted up a little theatre at the corner of Leicester Place, the post office now occupies the site, for his entertainment of songs and sketches, which he called The Sans Souci. Edmund Kean, when a boy, appeared here in some acrobatic performances. After Dibdin's time it was used more by amateurs than professionals, except for benefits. "Baron" Nicholson, in his memoirs, 1820, calls it "an elegant little theatre," but it was too small for any effective representations. In 1832 it was opened by subscription for vaudevilles. Two years afterwards a French company occupied it. After that it was closed.' - History of The London Stage' by H. Barton Baker 1904. The 1909 book 'London Town Past and Present' by W. W. Hutchings briefly mentions the Sans Souci Theatre saying:- 'Charles Dibdin, the composer of "Tom Bowling," opened a little theatre which he called the "Sans Souci," where he sang his own songs and produced dramatic sketches, but after a few years he had to shut it up and was glad to retire on a pension of which the next Government meanly deprived him, so that he died in poverty and misery.' - London Town Past and Present by W. W. Hutchings, 1909. There is some detailed information on the Leicester Place Sans Souci Theatre on the British History Online Website here, along with two images of the exterior and interior of the Theatre from the same site here.